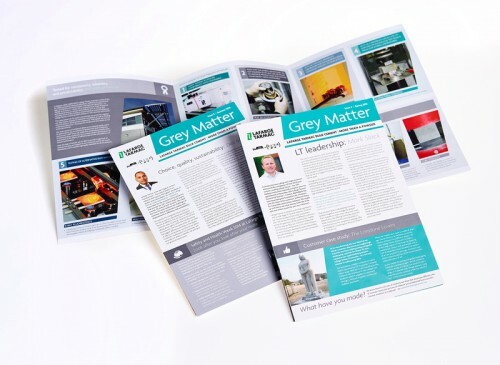 Introducing IN THE BAG and Grey Matter; two very different newsletters for Lafarge Tarmac cement solutions customers. 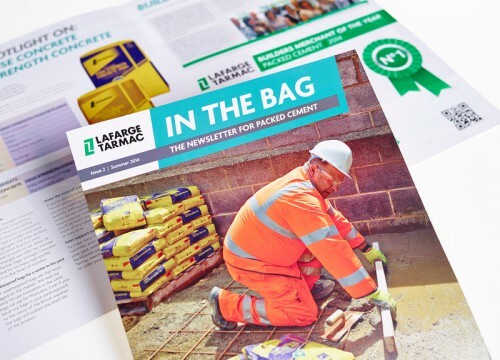 Lafarge Tarmac are a leading supplier of packed cement products – IN THE BAG’s audience includes Builders Merchants and Trade Counters, both the warehouses and the small, independents. We designed and provided copy for a new eye-catching newsletter full of useful product & technical information, exciting competitions and articles that give buyers an insight into daily life at Lafarge Tarmac. Meanwhile over at bulk cement, we gave Grey Matter – a pre-established newsletter now in its seventh issue – a makeover using elements of the new Lafarge Tarmac brand. So far feedback on the refresh has been positive. The audience for bulk cement have come to expect excellent sales and tech support, health & safety advice and useful information on cement applications, standards and innovations. We’re looking forward to working on the next two newsletters. 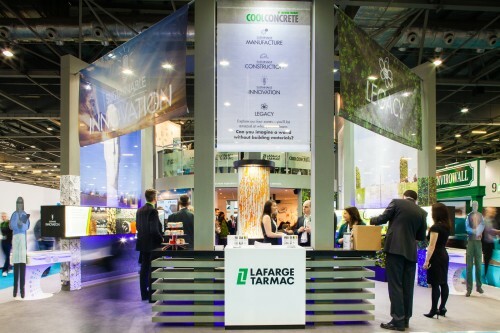 For the third year running we were asked by Lafarge – now Lafarge Tarmac – to design, produce and install the graphic elements to their two-storey stand at Ecobuild – the world’s biggest event for sustainable design, construction and the built environment. Their feature exhibit, Cool Concrete, was an educational experience that challenged visitors to look at the future of sustainable construction materials and their manufacture. The design evolved from the creation of four distinct zones, each with their own identity. An Innovation Zone and a Legacy Zone highlighted some of the sustainable rejuvenation projects Lafarge Tarmac have been involved with. The other two zones were Manufacturing and Construction. Here Lafarge Tarmac demonstrated, through project examples, their sustainable and innovative solutions. We created eight large light-box panels, which told the story behind each zone and in total, ten large photographic banners to give each zone a different look and feel. 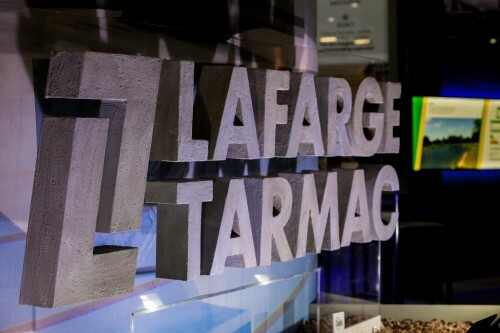 Events, such as LAMMA (the UK’s leading farm machinery equipment and service show) and BTME (Europe’s leading showcase for turf professionals and buyers), are a fantastic way for our client, Lafarge Tarmac, to showcase their products and to reach different industries directly. Lafarge Tarmac offer a wide range of durable, versatile aggregates from sites across the country. Aggregates can be used in a variety of applications both above and below the surface. We often see aggregates used for decorative purposes; for landscaping, footpaths and driveways. But there are also many uses for aggregates underground, including in concrete and asphalt production, sub-base, capping and drainage systems. Creative Triangle have developed a design concept for 13 exhibition panels which effectively illustrates the different applications of Lafarge Tarmac’s range of aggregates. The panels tell the story of each aggregate – how it’s made and it’s usages. Illustrations have been used to show how each type of aggregate could be applied to the industry, icons highlight the key features and benefits and large images with close-ups of the products demonstrate their properties. There are Perspex display boxes to showcase the products which complement the panels. 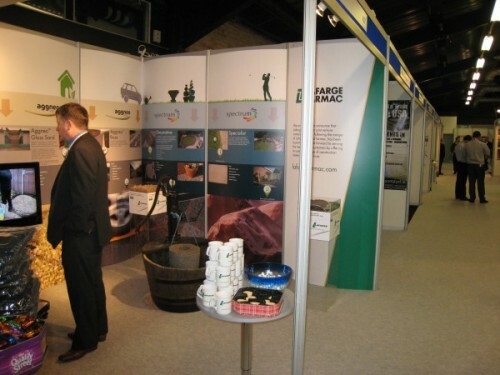 The exhibition panels work as a travelling exhibition stand which can be used at industry events across the country.